Any disputes you have with us must be resolved by individual CONFIDENTIAL, binding arbitration. Please read the Arbitration provision in these terms as it affects your rights under this contract. NOTHING IN THESE TERMS IS INTENDED TO AFFECT YOUR RIGHTS UNDER THE LAW IN YOUR USUAL PLACE OF RESIDENCE. IF THERE IS A CONFLICT BETWEEN THOSE RIGHTS AND THESE TERMS, YOUR RIGHTS UNDER APPLICABLE LOCAL LAW WILL PREVAIL. The Property is owned and operated by CJ E&M America, Inc. When we say “CJ,” “we,” “our,” or “us,” we mean CJ E&M America, Inc. When we say “you,” “your,” or “user,” we mean you. These Terms govern your use of the Property, including our websites, applications, emails, or other communications that link to or reference these Terms. If you object to the Terms or any changes hereto, or at any time become dissatisfied with the Property, your sole recourse shall be to cease using the Property. Your continuing use of the Property after notification of any change(s) (including notification by posting) constitutes conclusive evidence of your acknowledgement of the modifications and your agreement to be bound by such changes. The Property is for your personal, non-commercial use and is intended for informational and entertainment purposes only. All information, materials, and other content contained on the Property, including, but not limited to, images, illustrations, audio clips, and video clips (collectively, “the Material”) are protected by copyright and trademark and shall not be used for any purpose whatsoever other than private, non-commercial viewing purposes. Unless you’ve received our permission in writing, reproduction, duplication, distribution, republication, modification, derivative works, transmitting, uploading, publicly displaying, and other unauthorized copying or use of any of the Material is expressly prohibited. We do not transfer title to the Property, any part or portion thereof, to you. 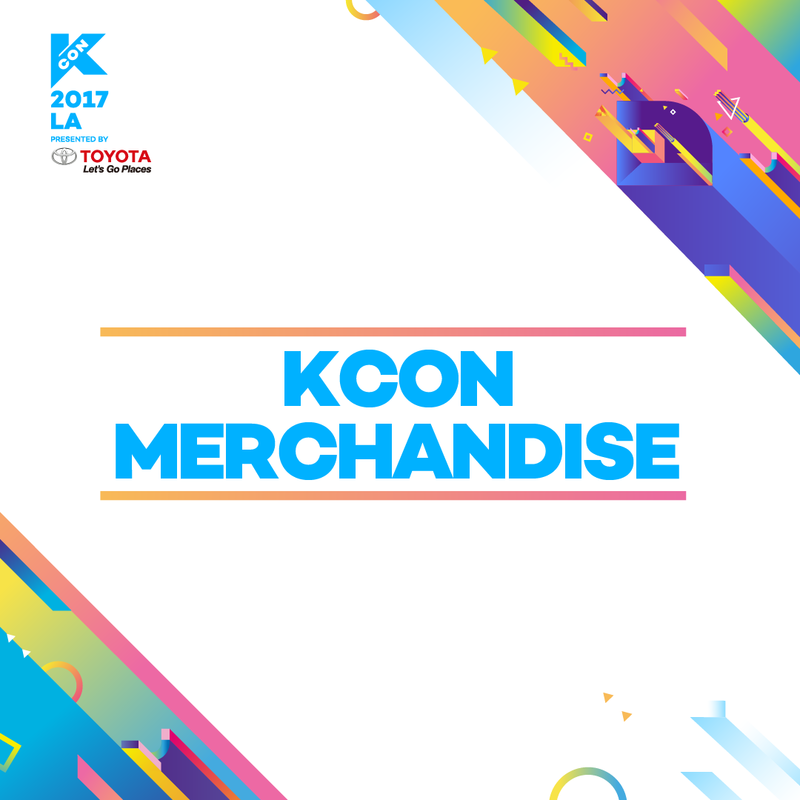 If you wish to license any of our Materials, please contact us at info@kconusa.com. Pursuant to 17 U.S.C. Section 512 as amended by Title II of the Digital Millennium Copyright Act (the “DMCA”), we reserve the right, but not the obligation, to terminate your license to use the Property if we suspect, in our sole and absolute discretion, that you are infringing our rights or the rights of others. If you believe that any Material contained in the Property infringes your copyright, please notify us of your copyright infringement claim by submitting a written complaint in accordance with the below requirements to our designated DMCA Copyright Agent at the e-mail or postal address provided below. We will process written complaints of alleged infringement which it receives and will take appropriate action as required by the DMCA and other applicable intellectual property laws. As a condition of use, you hereby promise that you will not use the Property for any purpose that is unlawful, commercial in nature, or prohibited by these Terms or any other agreement, or any other purpose not reasonably intended by us. You agree to abide by all local, state, national, and international laws, regulations, and rules. Without limiting the foregoing, you shall not: (1) post or transmit through the Property any defamatory, harassing, threatening, obscene, harmful, pornographic, or other material which would violate or infringe in any way upon the rights of others, or which would give rise to criminal or civil liability and/or violate federal or local law or regulation; (2) post or transmit through the Property any verbal, textual, or graphic communications that would cause fear of physical harm, intimidation, humiliation, or embarrassment to another person; (3) upload, post, or otherwise make available on the Property any material protected by copyright, trademark, or other proprietary right without the express permission of the owner of such copyright, trademark, or other proprietary right; and (4) use the Property for purposes of conducting or participating in any illegal activity. Functions on the Property may allow you to post, submit, or display materials on the Property (“User Generated Content”). You retain your rights to any User Generated Content created by you; however, by using the Property, you grant CJ a universal, non-exclusive, sub-licensable, irrevocable, and royalty-free license under all copyrights, trademarks, patents, trade secrets, privacy and publicity rights, and other intellectual property rights to use, copy, reproduce, process, adapt, modify, transmit, index, comment on, translate, print, exhibit, create derivative works based upon, make available, publish, distribute, redistribute, display, publicly perform, or otherwise exploit such material, or any portion thereof, in any and all media or distribution methods now known or later developed, as CJ shall select at its sole discretion. You agree that this license includes the right for us to promote, provide, and improve the Property and to make the material submitted to or through the Property available to other companies, organizations or individuals who partner with us. You represent and warrant that the User Generated Content conforms to the Terms and that you own or have the necessary rights and permissions, without the need for payment to any other person or entity, to use and exploit, and to authorize us to use and exploit, your User Generated Content in all manners contemplated by these Terms. You agree to indemnify and forever hold harmless us, including our parent, subsidiary and affiliated companies, and each of our respective employees and officers, directors, shareholders, and employees, from any demands, loss, liability, claims, or expenses (including attorneys’ fees), made against us by any third party arising out of or in connection with our use and exploitation of your User Generated Content. You also agree not to enforce any moral rights, ancillary rights, or similar rights in or to the User Generated Content against us or our licensees, distributors, agents, representatives, and other authorized uses, and agree to procure the same agreement not to enforce from others who may possess such rights. You agree and acknowledge that participation in the Property shall not give rise to any confidential, fiduciary, implied-in-fact, implied-in-law, contractual, or other special relationship between CJ and any user of the Property (other than the contractual relationship between you and CJ entered into by virtue of your agreement to these Terms). Promotions that you enter on the Property may have supplemental official rules and conditions, but the following general rules apply absent contrary terms in any supplemental official rules or conditions for the promotion. Your promotion entry shall be considered User Generated Content and is subject to all provisions of the Terms. We may disqualify entries that are late, misdirected, incomplete, corrupted, lost, illegible, or invalid. Use of automated entries, votes, or other programs is prohibited and all such entries (or votes) will be disqualified. We reserve the right to modify, suspend, cancel, or terminate a promotion, extend and/or resume the entry period, or disqualify any participant or entry, at any time, for any or no reason, without giving advance notice. We may do so in the event that we cannot guarantee the promotion will be carried out fairly or correctly for technical, legal, or other reasons, or if we suspect that any person has manipulated entries or results, provided false information, or acted unethically. If we cancel or terminate a promotion, prizes may be awarded as provided in that promotion’s official rules. The trademarks, logos, and service marks (collectively the “Trademarks”) displayed on the Property are registered and unregistered Trademarks of CJ and others. Nothing contained on the Property should be construed as granting, by implication, estoppel, or otherwise, any license or right to use any Trademark displayed on the Property without the written permission of CJ or such third party that owns the Trademarks displayed on the Property. Your use of the Trademarks displayed on the Property, or any other content on the Property, is strictly prohibited, except as provided in the Terms. If you choose to register as a user of the services provided through the Property, then you agree to provide current, accurate, and complete information about yourself, including your contact information and payment information, and to update the information when it changes. If you are under age 13, you are not permitted to register for the Property or use any features of the Property which requires registration. You agree not to impersonate or misrepresent yourself or your affiliation with any person or entity, including using another person’s username, password, or other account information, or another person’s name or likeness. You agree that we may take steps to verify the accuracy of any information you provide. If we suspect that your information is untrue or inaccurate, we may, in our sole discretion, suspend, terminate, or refuse future access to your membership. In addition, we may suspend or terminate your membership and your ability to use the Property if you engage in, encourage, or advocate for illegal conduct, or if you fail to comply with these Terms or any supplemental terms. You are responsible for taking reasonable steps to maintain the confidentiality of your username and password, and you are responsible for all activities conducted under your membership for which you have reasonable control. You agree to promptly notify us of any unauthorized use of your username, password, or other account information, or of any other breach of security that you become aware of involving your membership with the Property. You are solely responsible for providing, at your own expense, all equipment necessary to use the Property, such as your own computer or Internet access. If you use a service on the Property that requires you to pay a fee, then you agree to pay all fees associated with such service. In such event, you agree to provide us with accurate and complete billing information, including, without limitation, valid credit card information, your name, address and telephone number, and to provide us with any changes in such information as necessary. If, for any reason, your credit card company refuses to pay the amount billed for the service, you agree that we may, at our sole discretion, suspend or terminate your access to the services on the Property and require you to pay the overdue amount by other means acceptable to us. We may charge a fee for reinstatement of suspended or terminated accounts. Any dealings, communications, promotions, and transactions, including but not limited to, payment and delivery of goods or services, any other terms, conditions, warranties, or representations associated with such dealings, by and between users and third party advertisers, third party merchants, and other third party vendors found on or through the Property or by participation in promotions (collectively, “Property Affiliates”), are solely between you and such Property Affiliates. CJ shall not be responsible or liable for any part of any such dealings. The Property may link to other websites, services, or applications on the Internet. These other services are not under CJ’s control, and you acknowledge and agree that we are not responsible for the accuracy, legality, appropriateness, or any other aspect of the content or function of such services. The inclusion of any such link does not imply endorsement of the website by CJ or any association with its operators. Additional or different terms and conditions and privacy/data use policies/statements may apply when you access and use such other websites. You understand that temporary interruptions of the services available through the Property may occur. You further understand and agree that we have no control over third party networks that you may access in the course of using the Property, and therefore, delays and interruptions of other network transmissions are completely beyond our control. We shall have the right to immediately terminate your use of the Property if we determine in our sole discretion that you have violated the Terms or have engaged in conduct to be unacceptable or otherwise contrary to these Terms. We may terminate your account or access to the Property, or remove and discard any communication transmitted by you via the Property, for any reason and without prior notice. The Property is constantly evolving and changing over time. We reserve the right to modify, add or discontinue any aspect, content, or feature of the Property, at any time, in any way, for any or no reason. We shall have the right, but not the obligation, to monitor content posted on the Property in order to respond to or comment upon communications by users of the Property and in order to determine compliance with the Terms. We shall have the right and sole discretion to edit, refuse to post, or remove any content for any reason, including, but not limited to, violations of the Terms and your abuse of the Property. Although the Property may be accessible worldwide, we make no representation that Materials on the Property are appropriate or available for use in locations outside of the United States, and accessing them from territories where their contents are illegal is prohibited. Those who choose to access the Property from other location do so on their own initiative and are responsible for compliance with local laws. Any offer for any product, service, and/or information made in connection with the Property is void where prohibited. Your use of the Property is at your own risk. You assume full responsibility for implementing the appropriate procedures and checks to satisfy your own requirements for the suitability of the Property. You acknowledge that your use of the Property and any information sent or received in connection with the Property may not be secure and may be intercepted by unauthorized third parties. You assume responsibility for the entire cost of all necessary maintenance, repair, or correction to your computer system or other property. THE PROPERTY’S SERVICES ARE PROVIDED “AS IS” AND “AS AVAILABLE.” WE DISCLAIM ALL CONDITIONS, REPRESENTATIONS, AND WARRANTIES, EXPRESS OR IMPLIED, INCLUDING, BUT NOT LIMITED TO, IMPLIED WARRANTIES OF MERCHANTABILITY, FITNESS FOR A PARTICULAR PURPOSE, AND NON-INFRINGEMENT, AND WARRANTIES IMPLIED FROM A COURSE OF DEALING OR COURSE OF PERFORMANCE. WE SHALL NOT BE LIABLE TO YOU OR ANY THIRD PARTY FOR INDIRECT, INCIDENTAL, SPECIAL, OR CONSEQUENTIAL DAMAGES, INLUDING, BUT NOT LIMITED TO, LOST PROFITS AND PROPERTY DAMAGE, EVEN IF WE WERE ADVISED OF THE POSSIBILITIES OF SUCH DAMAGES, NOT SHALL WE BE HELD LIABLE FOR DELAY OR FAILURE IN PERFORMANCE RESULTING FROM CAUSES BEYOND OUR REASONABLE CONTROL. IN NO EVENT SHALL OUR TOTAL LIABILITY TO YOU FOR ALL DAMAGES, LOSSESS, AND CAUSES OF ACTION EXCEED ONE HUNDRED UNITED STATES DOLLARS (US$100). SOME JURISDICTIONS PROHIBIT THE EXCLUSION OR LIMITATION OF LIABILITY FOR CONSEQUENTIAL OR INCIDENTAL DAMAGES, SO THIS PROVISION MAY NOT APPLY TO YOU. THE PROPERTY COULD INCLUDE TECHNICAL OR OTHER MISTAKES, INACCURACIES OR TYPOGRAPHICAL ERRORS. WE MAY MAKE CHANGES TO THE MATERIAL AND SERVICES ON THE PROPERTY, INCLUDING THE PRICES AND DESCRIPTION OF ANY PRODUCTS LISTED HEREIN, AT ANY TIME WITHOUT NOTICE. THE MATERIALS OR SERVICES ON THE PROPERTY MAY BE OUT OF DATE, AND WE MAKE NO COMMITMENT TO UPDATE SUCH MATERIALS OR SERVICES. THE USE OF THE PROPERTY, ITS FUNCTIONS OR SERVICES, AND/OR THE DOWNLOADING OR OTHER ACQUISITION OF ANY MATERIAL THROUGH THE PROPERTY, IS DONE AT YOUR OWN DISCRETION AND RISK AND WITH YOUR AGREEMENT THAT YOU WILL BE SOLELY RESPONSIBLE FOR ANY DAMAGE TO YOUR COMPUTER SYSTEM OR LOSS OF DATA THAT RESULTS FROM SUCH ACTIVITIES. You agree to defend, indemnify, and hold harmless us and our directors, officers, employees, and agents from and against all claims, losses, costs, and expenses (including attorneys’ fees) arising out of your use of the Property, or arising out of any violation of the Terms, including, but not limited to, any communication by you which is claimed to be defamatory, obscene or otherwise unlawful, which is claimed to violate the copyright, trademark, proprietary, or other rights of third parties, or which constitutes a submission of materials. You and CJ agree to confidentially arbitrate all disputes between you and CJ, its parents, subsidiaries or affiliates, except disputes relating to the enforcement of CJ’s or its parents’, subsidiaries’, or affiliates’ intellectual property rights. “Dispute” includes any dispute, action or other controversy between you and us concerning the services or the Terms, whether in contract, tort, warranty, statute or regulation, or other legal or equitable basis. You and CJ empower the arbitrator with the exclusive authority to resolve any Dispute relating to the interpretation, applicability or enforceability of these Terms or formation of this contract, including the arbitrability of any Dispute or any claim that all or any part of these Terms are void or voidable. In the event of a Dispute, you or CJ must send to the other party a notice of dispute, which is a written statement that sets forth the name, address and contact information of the party giving the notice, the facts giving rise to the dispute and the relief requested. You must send any notice of dispute to CJ E&M America, Inc., 3530 Wilshire Blvd., Suite 1220, Los Angeles, California 90010, Attention: Legal Department/Arbitration Notice. We will send any notice of dispute to you at the contact information we have for you. You and CJ will attempt to resolve a dispute through informal negotiation within sixty (60) days from the date the notice of dispute is sent. After sixty (60) days, you or we may commence arbitration. If you and CJ do not resolve a Dispute by informal negotiation, the Dispute shall be settled by confidential, binding arbitration before a single, neutral arbitrator whose decision will be final except for a limited right of appeal under the U.S. Federal Arbitration Act. YOU ARE GIVING UP THE RIGHT TO LITIGATE A DISPUTE IN COURT BEFORE A JUDGE OR JURY. Arbitration will be administered by the American Arbitration Association (the “AAA”) under its Commercial Arbitration Rules and its Supplementary Procedures for Consumer Related Disputes. Arbitration may be conducted in person, through the submission of documents, by phone or online. The arbitrator may award damages to you individually as a court could, including declaratory or injunctive relief, but only to the extent required to satisfy your individual claim. The arbitration shall be conducted in Los Angeles County. The arbitrator shall follow California law, without regard to its conflict of law rules, and the Federal Rules of Evidence in adjudicating the dispute. The parties waive the right to seek punitive damages and the arbitrator shall have no authority to award such damages. The arbitration proceedings and arbitration award shall be maintained by the parties as strictly confidential, except as is otherwise required by court order or as is necessary to confirm, vacate or enforce the award and for disclosure in confidence to the parties’ respective attorneys, tax advisors and senior management and to family members of a party who is an individual. PROCEEDINGS TO RESOLVE A DISPUTE WILL BE CONDUCTED ON AN INDIVIDUAL BASIS. Neither you nor CJ will seek to have a dispute heard as a class action, private attorney general action, or in any other proceeding in which either party acts or proposes to act in a representative capacity. No arbitration or proceeding can be combined with another without the prior written consent of all parties to the arbitration or proceeding. If the class action waiver is found to be illegal or unenforceable as to all or some parts of a dispute, those parts will be severed and proceed in a court of law, with the remaining parts proceeding in arbitration. The Terms constitute the entire agreement of the parties and supersedes all prior or contemporaneous written or oral agreements between the parties with respect to the subject matter hereof. You may not assign your rights and obligations under the Terms to any party, and any purported attempt to do so shall be null and void. We may freely assign our rights and obligations under the Terms. If any term or change to the Terms is found invalid, void, or for any reason unenforceable, that term or change is severable and does not affect the validity and enforceability of any remaining terms, changes, or conditions, all of which shall remain in full force and effect. We shall not be liable to you in any way for any value or benefits you may lose as a result of any changes to the Property. The provisions of the Terms which by their nature should survive the termination of the Terms shall survive such termination. No waiver of any provision of the Terms by us shall be deemed a further or continuing waiver of such provision or any other provision, and our failure to assert any right or provision under the Terms shall not constitute a waiver of such right or provision. This Agreement shall be construed in accordance with the laws of the State of California, and parties consent to the jurisdiction of the courts in the Central District of California, County of Los Angeles, without regard to its conflict of laws rules. The Property is controlled and operated by CJ from our offices within the State of California, United States of America. Users of the Property attempting to access the Property from other locations shall comply with any applicable local laws governing interactive sites. Four Reasons You Should Be Excited For The KCON17NY Concerts! 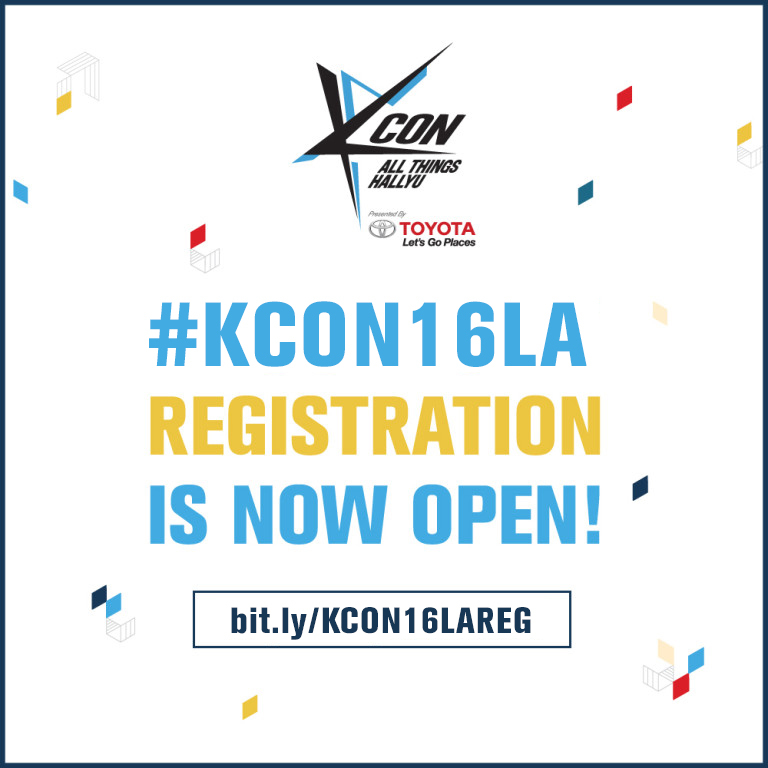 How to Register for Your KCON16LA Convention Tickets! 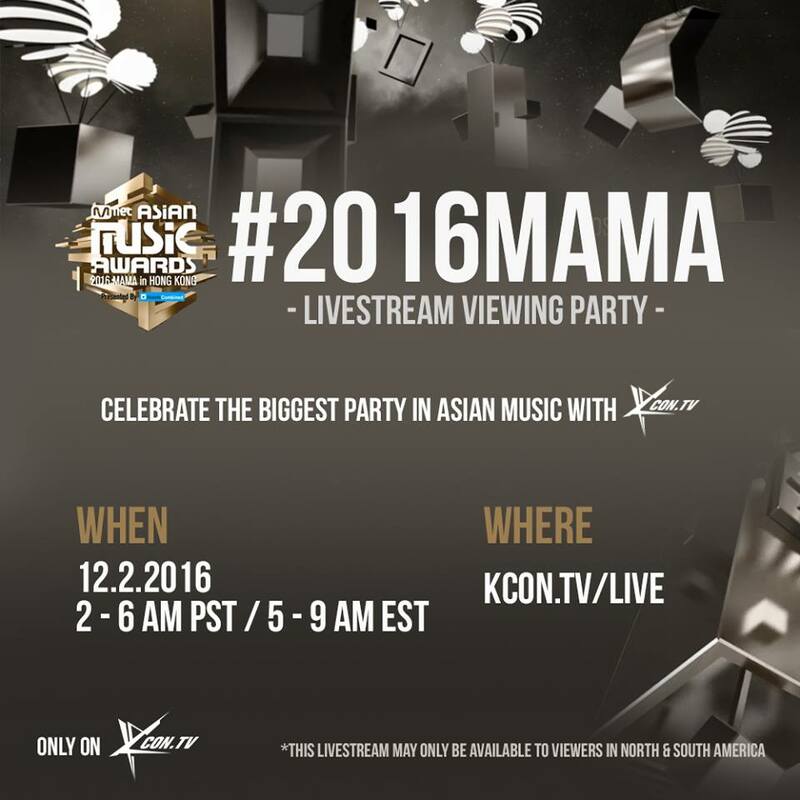 [#2016MAMA] Live Stream on KCON.TV!